For those of us who celebrate Christmas, this time of year is resplendent with sights, songs, and smells that bring the holiday instantly to mind. Most of us who grew up with a real Christmas tree in the house are instantly transported by the smell of a freshly cut fir tree. For others, it’s the smell of pies baking. For the ancients, it was frankincense and myrrh. For me… it’s latex paint. Wait, I can explain! As many families do, we always had a lot of people over to the house around Christmastime, and many of them were folks who might only visit once a year. So the holidays were a natural time to spruce the house up, including whatever interior painting needed doing that year. So my olfactory memory of Christmas blends pine needles, interior latex eggshell paint, pies baking, and the unique smell of brand new plastic toys and electronics. At one time, though, especially in Europe, one of the classic smells of the Yuletide was Christmas ale. Brewers have always made special beers for religious holidays, and over the last few hundred years Christmas ales have been popular during the holiday season. Though Christmas ale is basically a catch-all descriptive phrase, these beers tend to have several things in common. Almost all of them are dark, or at least go for a rich amber color suggesting heartiness. They also tend to be stronger than average, ranging from 5.5% at the low end to more than 14% for age-worthy after-dinner beers. Belgium, England, Scandinavia, and the United States are all major producers of these beers, though in this country we tend to use more inclusive names such as holiday ale. At one time, especially in England, Christmas ales were often spiced and sometimes mulled. Wines, ales, and ciders were often served this way around the holidays and were referred to collectively as wassail, a drink often consumed while caroling. Today, many American craft breweries produce spiced ales at the holidays, harking back to the old tradition. As you go shopping for your Christmas table, remember that beer can work wonders with a wide array of holiday foods. Belgian saison, Belgian witbier (white beer), and Bavarian weissbier (also known as hefeweizen, the fruity German wheat beer style) are light and spritzy, making them great earlier in the day, especially with brunch. As you move into dinner, French farmhouse ales, called bières de garde, have nice caramel and earthy anise-like flavors, making them particularly good with turkey and ham. Belgian Christmas ales, almost universally dark, strong and plummy, are great with lamb, duck, and goose. Traditional Mexican cuisine reaches some its greatest heights at Christmas, when people make the complex and time-consuming dark mole sauces, many of them based on nuts, chilies, and chocolate. Served with chicken, duck or the traditional turkey, these can be wonderful with rich, dark porter beers; there the roast character of the beer will pick up perfectly on the chocolate in the sauce. Also from Mexico, one of my favorite Christmas dishes is chile en nogada, a poblano pepper stuffed with spiced minced pork and fruit, covered in a walnut-based frosting, and studded with pomegranate seeds. It’s as beautiful to look at as it is delicious to eat, and it’s great with those massive West Coast “double IPAs”. The big hop flavors really pick up on the flavor of the poblano pepper, while the bitterness provides the cutting power for this super-rich dish. After dinner it’s time for big chocolaty imperial stouts and fruity, warming barley wines. While they aren’t sweet, both of these have enough residual sugar to work with desserts, and they’re often a far better match than dessert wines. Barley wines, which are well-aged beers usually over 9% ABV, bring concentrated malt and dark fruit flavors that are great with cheeses, especially the British Christmas classic, Stilton. Many years ago, shortly after Christmas, I visited with a friend in the English countryside. “Mummy always gets a Stilton at Christmas” he intoned, and the Stilton — at least a foot across — was wheeled out on its own purpose-built cart. It looked like it could feed a family of five for the entire winter, and I’ve little doubt that it actually did. Some British barley wine was a magnificent accompaniment. Imperial stouts are at least as good with Stilton, and even better with desserts, especially ice cream, chocolate cakes, tarts, and all sorts of cookies. Finally, Christmas is a great time to go out and put together a little after-dinner beer tasting. Many of the world’s greatest beers cost scarcely more than a fancy cup of coffee. If you’re having people over or going to visit friends and family, why not gather up ten beers you’ve been curious to taste? There will be plenty of people to taste them with you, and hopefully plenty of time for tasting. After all, Christmas isn’t just for the kids, and although you might not be unwrapping a bright yellow Tonka truck on Christmas morning, adulthood does have its privileges. For the designated drivers (our heroes! ), make some ludicrously sinful spiced hot chocolate; my personal favorite is from Jacques Torres. Here’s wishing everyone a happy, healthy, wonderful Christmas — and don’t forget to touch up the paint. Garrett Oliver, editor of The Oxford Companion to Beer, is the Brewmaster of the Brooklyn Brewery and author of The Brewmaster’s Table: Discovering the Pleasures of Real Beer with Real Food. He has won many awards for his beers, is a frequent judge for international beer competitions, and has made numerous radio and television appearances as a spokesperson for craft brewing. 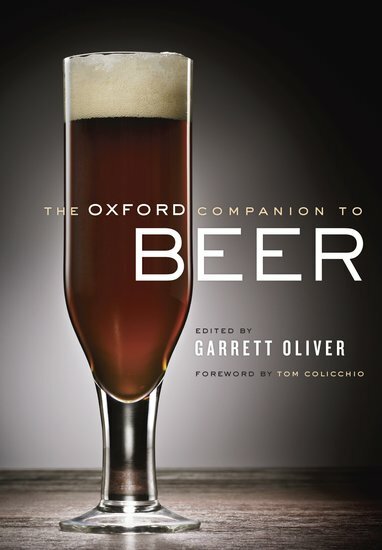 The Oxford Companion to Beer is the first major reference work to investigate the history and vast scope of beer, featuring more than 1,100 A-Z entries written by 166 of the world’s most prominent beer experts. It is first place winner of the 2012 Gourmand Award for Best in the World in the Beer category, winner of the 2011 André Simon Book Award in the Drinks Category, and shortlisted in Food and Travel for Book of the Year in the Drinks Category. View previous Oxford Companion to Beer blog posts and videos. Subscribe to only food and drink articles on the OUPblog via email or RSS. 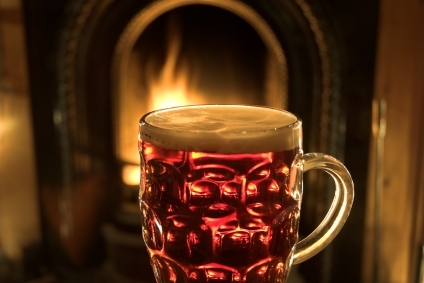 Image credit: Pint of beer by the fireside. Photo by Marbury, iStockphoto.